Have you worked hard to pay your credit card debt off only to find yourself later with credit card debt again? 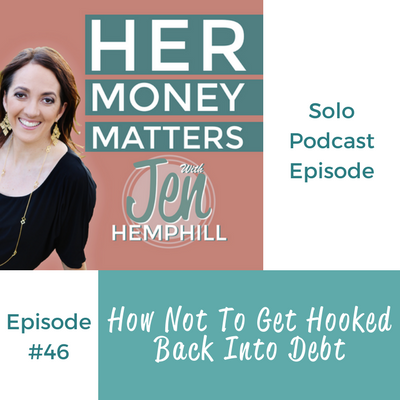 In this episode we discuss this and what you can do to prevent getting hooked back into debt! Using the credit card to charge things does not have to be part of that backup plan! Don’t forget you have free access to our community! I’d love to hear from you, what is your takeaway from this episode? Be sure to let me know in the comments below! [00:00:08] ANNOUNCER: Welcome to the Her Money Matters Podcast, the podcast to help you take control of your finances. 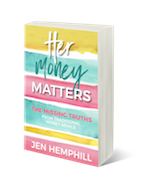 Join your host, motivational money coach, Jen Hemphill, as she shares with you practical, simple money insights into real life stories by women like you. [0:00:27.1] JH: Hey there, I am so glad to have you here with me today. This is Jen Hemphill and if you couldn’t tell already, if you’ve been listening to maybe for a while, I absolutely love doing these podcast episodes and it makes it a thousand times better to know that someone is listening because can you imagine doing this work and then no one listens, that wouldn’t be cool. So I really, really appreciate you taking some time to listen to this episode. Today we are going to continue talking about debt. Yes, it’s something we don’t like to think about but if we want to get rid of it, we got to face it head first and if you recall on Episode 44, we talked about seven layers when paying debt. If you haven’t listened to that, definitely I recommend downloading that and listening to that episode. But in today’s episode, we are going to discuss something that happens quite often, especially with credit card debt. That being, you pay it off and somehow you get hooked back into that debt cycle. So we’re going to talk about that and what you can do to prevent it. But the conversation, just remember, it doesn’t stop here. If you haven’t done so already, I invite you to join us into Her Money Matters community over on Facebook. 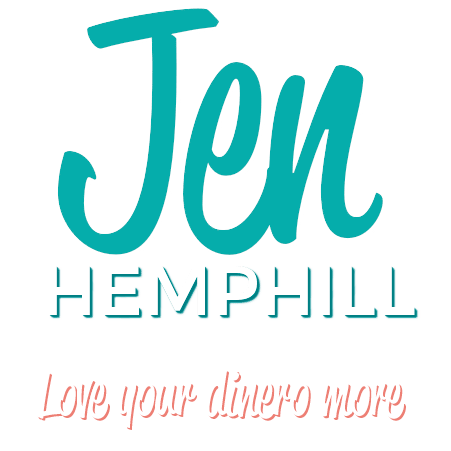 It’s really super simple to join, you can just go over to Jenhemphill.com/community. That link will take you directly to the Facebook group and all you have to do is click join and we’ll be sure to add you. So in today’s episode, we’re going to talk about the shift that you have to make in your mind to really prevent that debt to be happening again and we’re also going to talk about one area in your budget that you need to pay closer attention to and it’s probably not what you’re thinking about which is normally food, right? Food is where one area where you tend to overspend on but it’s not that. I’m also going to discuss a critical action that many miss and if you take this action, you are way ahead of so many people and it’s going to definitely help you to not get back in that debt cycle. Before we get started though, fully, I wanted to give a quick shootout to one of our listeners, her name is Darla and she is a member of our Her Money Matters community on Facebook and I have to tell you, she’s just been such a huge cheerleader regardless of the rough patch that she has been through recently. She’s in there cheering people on, she’s participating, she’s engaging that into different conversation. She’s also managed to make me blush a time or two just because of the kind words that she has shared with me. So Darla, just a little shout out to show that I definitely appreciate you. Let’s go ahead and get on to today’s episode. [0:03:54.7] JH: Debt, the dreaded debt and it’s not fun when you work so hard, especially with the credit card debt that you pay it off and then you find yourself in credit card debt again. We’re really going to tackle how you can prevent that from happening. The first thing that you need to do and you need to consider is that you need to shift what you’re thinking in your mind and you have to make the decision and commit to the decision that this kind of debt, this credit card debt doesn’t have to be part of your backup plan. That’s what tends to happen. Okay, we tend to think, “Well we can’t pay for it, let’s just charge it on the credit card and deal with it later,” right? That’s what happens, that’s what typically tends to happen. We really have to ahead of time and just work on that, make the decision. Make that shift that using this credit card to charge things does not have to be part of that backup plan because that itself, you’re creating more debt again. So definitely shift how you think. You also want to get clear on two things, non-monthly expenses and variable expenses. Okay, so non-monthly expenses can be bills that come up so non-monthly expenses can be fixed like the one the come due, there’s a certain amount that you know there’s going to be. So that could be this quarterly bills, maybe your trash bill, your water bill if it comes quarterly. Those type of things that come non-monthly. Variable expenses, they’re also non-monthly but they vary in how much you spend. So that could be clothes, that could be whether — maybe at the salon. It could be different things like that that vary. So they’re also non-monthly or they are typically a non-monthly because you also have the groceries. Well groceries you’ve got to eat every single day, so you’re going to have that every month but those expenses vary, right? They’re not fixed a certain amount unless you’re really super good about sticking to what you plan to spend on the groceries. Because what tends to happen, monthly fixed expenses, when it comes to talking about a monthly plan, a budget, a spending plan, whatever you want to call it. The monthly fixed expenses, they’re not usually the problem because they’re fixed, we know we have to pay them, we take care of them and move on, right? But it’s really more than non-monthly expenses like your quarterly bills that I mentioned, the variable expenses that I mentioned like your groceries, your clothes, that’s what can cause a havoc and within your budget. Can I get an amen? That’s what tends to happen. So let’s say you got clear on these expenses and you put this number in your monthly budget, right? That’s what I teach, you need to get clear on your expenses, put in you monthly budget and let’s say everything looks good then you went about your business. Okay, so let’s think about that. Let’s make sure everything looks good, you went about your business. But then, let’s imagine that for a moment your income hits your account. Your fixed bills come out, right? You do your groceries, you put gas on the car, maybe you go to your favorite spot. For this scenario, let’s say that you stay within your limits, right? That you didn’t go over what you planned. So let’s just say that for example. But what happens to that supposed money you have there for those non-monthly expenses? Okay, so let’s take a moment to think about that. In the world of budgeting and in the world of your budgeting tool, whatever you’re using, the money should be there, right? Because you put it in your budget. You allotted the certain amount are for groceries, the certain amount for gas. Typically and ideally, it should be there. What happens when you go a little over what you projected or when you’re super busy because that never happens, right? Of course it does, but when you’re super busy and you need to make a decision, a quick decision to check your account to just make sure the money’s there so you can pay whatever — make the expense that you need to make. So you spend it but you forget about the upcoming non-monthly expense, or that summer camp for the kids that you had projected and you put it in your budget, right? It just happens. Don’t beat yourself up over it because you’re busy, it can happen. So if you think about that, can you see how it throws off your cash flow? It’s just that how that money that you “put in your budget” that you allotted to spend on certain things that are non-monthly or that are variable. Can you see how it can magically disappear if you don’t have a good system in place? That’s the key, you got to have a good system in place. So this is where I find many miss a step which causes most people to just throw up their hands in the air, say, “Forget it. I give up, I’m done with budgeting.” So don’t worry because there’s an easy solution for this. The easy solution is to set the money aside. Okay? So you want to set that money aside for those non-monthly and variable expenses. Of course you can keep that money in that account because we traditionally, when we think about our money, we think about one saving account and one checking account. So you can put the money in there but you’ve just got to make sure you’re diligent and disciplined on keeping tabs with the money especially in those scenarios that I mentioned where you’re super busy. You’ve got to make a decision, you have to purchase something, something last minute came up and then you want to make sure that you’re able to think of the things that are coming up with that money that’s in the account, in your budget, you setup to pay certain things with that money. That’s why I find that completely separating the money does the trick. I’m really a huge fan of having multiple accounts for these purposes. You can think of it as an envelope system but a virtual one. What’s also great about this is it’s easier to track, because let’s say you separate some money just for groceries and there’s accounts just for groceries. When you’re taking money out and you’re spending it just for groceries, you know it’s for groceries so it’s so much easier to track and when those non-monthly expenses can due. For let’s say your trash, maybe its quarterly or your water bill, those quarterly. You just go to that account, you separate it to, you simply transfer it to your main account and you pay that bill. It’s such a beautiful thing, it doesn’t cause overwhelm and doesn’t cause stress because you were already setting it aside. But you want to make sure that, let’s say you know your — I don’t know? Whatever bill, your quarterly water bill is — I’m throwing just a simple — is $100 usually. Don’t stop setting that money aside just once your each it. Continue because you’re going to have another quarterly bill, right? So really don’t stop setting that money aside once you reach that amount that you need. The other part of this, of not getting hooked back into debt is building an emergency fund, and I know I’ve talked about this before, but also setting parameters to what an emergency is. If you’re listened to this podcast and you’ve heard me talk about emergency funds, I definitely talk about this. So doesn’t hurt to repeat it. You’ve got to build that emergency fund and set parameters to what an emergency is. So I know you’re familiar with what an emergency fund is and how important it is to build one, right? I’m not going to go in to how much you should have because really for this episode, what appears to have one. You can prevent from getting back into that credit card debt. And I know, you and I, I know I’ve been guilty of this a time or two where you’ve built an emergency fund and then you take money out of that account for none emergency purposes, right? You’ve done that, I’ve done that, we’ve all done that. Here’s the thing, you’ve worked so hard to build an emergency fund for emergencies. So what helps big time is really to define what exactly is considered an emergency for your particular household and get really crystal clear as to what this is. When you set those parameters, you're going to lessen the number of times that you take out money for none emergency purposes because you’ve already decided what’s an emergency and what is not an emergency. But what will help even more is what we talked about just a little earlier is setting those non-monthly expenses money aside. So that’s why we reach, not 100% of the time, but when we have to tap in to an emergency account for none emergency things is because we didn’t set the money aside in the first place for those non-monthly expenses that come up. So if we set that money aside, for those non-monthly expenses that come up and we have it when they come up, we’re not going to be tapping into an emergency fund and therefore that’s just another preventative measure of not getting hooked back into that debt cycle. Because think about it, when you shop for back to school, maybe you’re needing to replace tires, a summer camp, that vacation, all those things you’ve got to think about and you got to start setting that money aside. And granted this is not an overnight process because you have to look what fits in your budget, what doesn’t? You have to do some tweaks here and there, but it eventually, it will come together if you work at it. So that’s just getting at it, figuring it out, seeing what works, what doesn’t? How you can tweak your budget to make sure that you can set that money aside for those different things that come up every once in a while. So those are really the things that will definitely make a big difference in terms of not getting hooked back into the debt cycle. So again, it’s making that mind, that shift and how you think because getting that credit card doesn’t have to be part of your backup plan. It’s getting clear on those non-monthly and variable expenses. It’s also taking that action and setting that money aside for those non-monthly and variable expenses and building that emergency fund and setting those parameters to what an emergency is. So that is it for today’s show. I hope that you have found that of value and I challenge you to make sure that you ask these — see if you’ve set this up, if you have made that shift, if you have gotten clear on your monthly expenses. If you have taken that step that so many are missing, is setting that money aside and making sure that in addition to building your emergency fund that you have set parameters that you are clear as to what an emergency is and what an emergency is not. Doing those things is definitely going to help you to prevent creating that extra credit card debt that a lot fall back into even after paying it off, which is definitely very frustrating for everybody that falls into that situation. So that is a wrap for today, definitely tune in for next week’s episode, that is Episode 47, where I introduce you to a new fabulous guest who is literally a wealth of knowledge in the area of building wealth and yes, the pun was fully intended here and you’ll see why once you meet her. So I really want to thank you for taking time out of your busy schedule to tune in to the show, you can check out the show notes at Jenhemphill.com/46 and thanks again for listening, one more time. I’ve said thank you probably like three to five times, and we’ll catch you in the next Thursday.